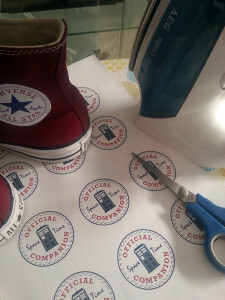 You are at:Home»DIY»Pimp your Chucks – become a Companion! The 10th Doctors red Chucks are legendary. And I, too, couldn’t resist to buy a pair of original dark red Converse while thinking of David Tennant. 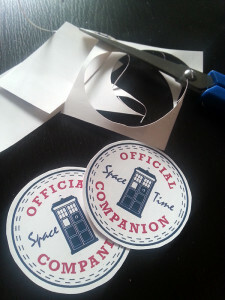 But something was missing, so let’s do some crafting! Easy-peasy and real quick! 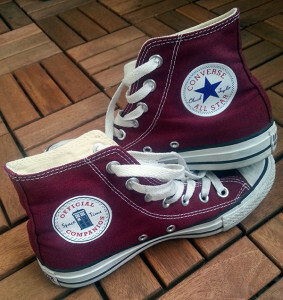 Of course some Converse Chuck Taylor Sneaker High, in red or dark red. It’s good to have a small slat to have the leg of your shoes plain and even. First: read the instructions for your transfer very carefully. Print your motive the way they suggest. Carefully cut the circles and move off the protective sheets. Lay the slat in your shoes leg, the original patch should be plain. Place your transfer circle on the original patch. Fix it with your iron (level 1, no steam), and iron it as long as the instructions say. Be careful, the gum of the original patch can’t handle to much heat. It took me 30min and now I can take my fandom with me in a very subtle way. I’ve designed the patches myself with Photoshop. If you like to do it to: Use Illustrator (it’s way easier with vectors). My patches have a diameter of 4,7cm, I don’t know if it changes with increasing shoe size. If you like to use my template, drop me a line, I’ll send it to you! I’m completely in love with my “new” chucks, they are fantastic! I really hope they pass the everday test. I will report after a few days of rain and some concert endurance tests!